No matter what the tax rates have been, in postwar America tax revenues have remained at about 19.5% of GDP. In 2009, we found total tax collections the U.S. government averaged 17.8% of GDP in the years from 1946 through 2008, with a standard deviation of 1.2% of GDP. Hauser's Law had held up to scrutiny in principal, although the average was less than what Hauser originally documented in 1993 due to the nation's historic GDP having been revised higher during the intervening years. We're revisiting the question now because some members of the new Democrat party-led majority in the House of Representatives has proposed increasing the nation's top marginal income tax rate up to 70%, nearly doubling today's 37% top federal income tax rate levied upon individuals. Since their stated purpose of increasing income tax rates to higher levels is to provide additional revenue to the U.S. Treasury to fund their "Green New Deal", if Hauser's Law continues to hold, they can expect to have their dreams of dramatically higher tax revenues to fund their political initiatives crushed on the rocks of reality. Meanwhile, the U.S. Bureau of Economic Analysis completed a comprehensive revision to historic GDP figures in 2013, which significantly altered (increased) past estimates of the size of the nation's Gross Domestic Product. 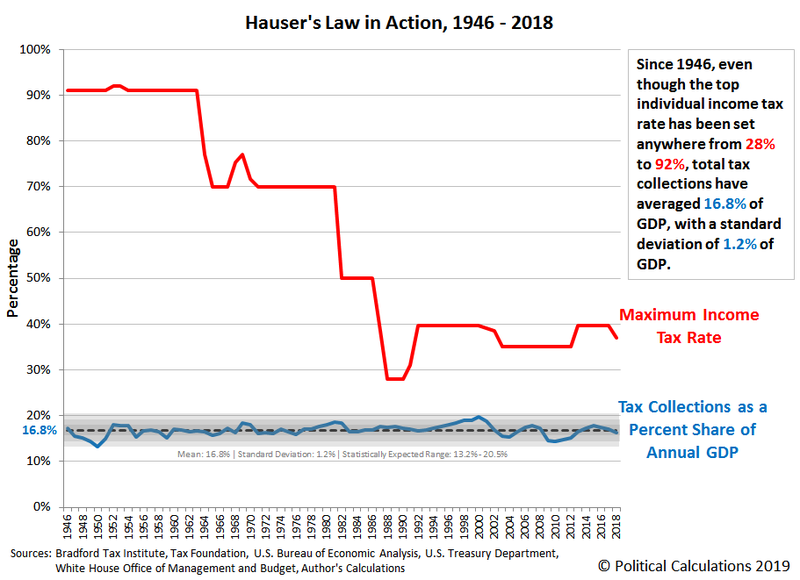 The following chart shows what we found when we updated our analysis of Hauser's Law in action for the years from 1946 through 2018, where we're using preliminary estimates for the just-completed year's tax collections and GDP to make it as current as possible. From 1946 through 2018, the top marginal income tax rate has ranged from a high of 92% (1952-1953) to a low of 28% (1988-1990), where in 2018, it has recently decreased from 39.6% to 37% because of the passage of the Tax Cuts and Jobs Act of 2017.